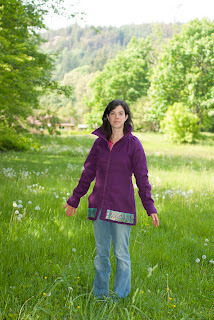 I finally got outside this weekend to take photos of my finished Minoru jacket! 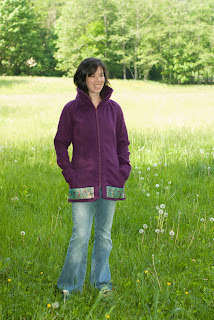 I followed Tasia's Minoru Sew-Along (a few months later, as my little one was a newborn during the actual Sew-Along). The pattern instructions were very clear and easy to follow, but there's nothing better than following more detailed instructions complete with photos. 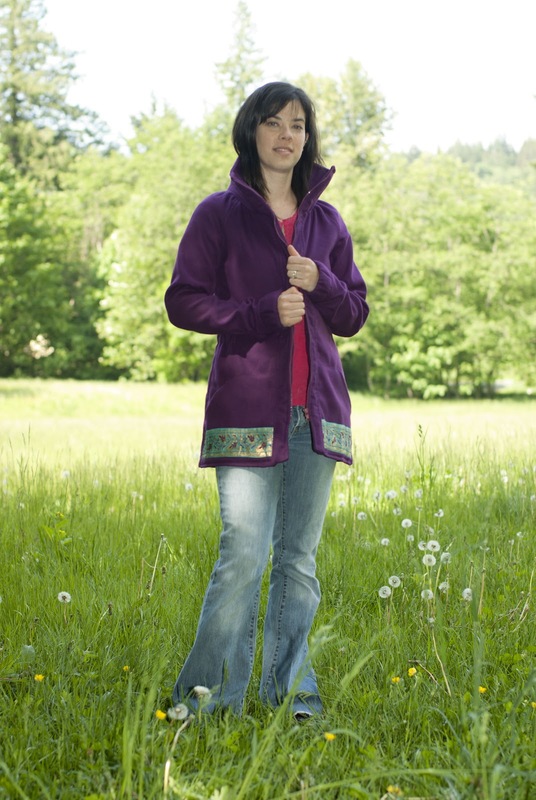 I added two pockets on the front of the jacket and blinged 'em up a bit with some sari trim! Party on the inside with lining fabric from the thrift store! My new favourite skill I've learned on this project is how to stitch a lining to a sleeve without slip-stitching. I really don't like hand-sewing, mostly because I'm so impatient and just want my project finished like 2 seconds ago. So this was a fantastic little method to add to my toolbox! Check it out! I'm aware that the lining fabric totally clashes with the sari trim on the front pockets, but both went so well with the purple jacketing that I didn't care. 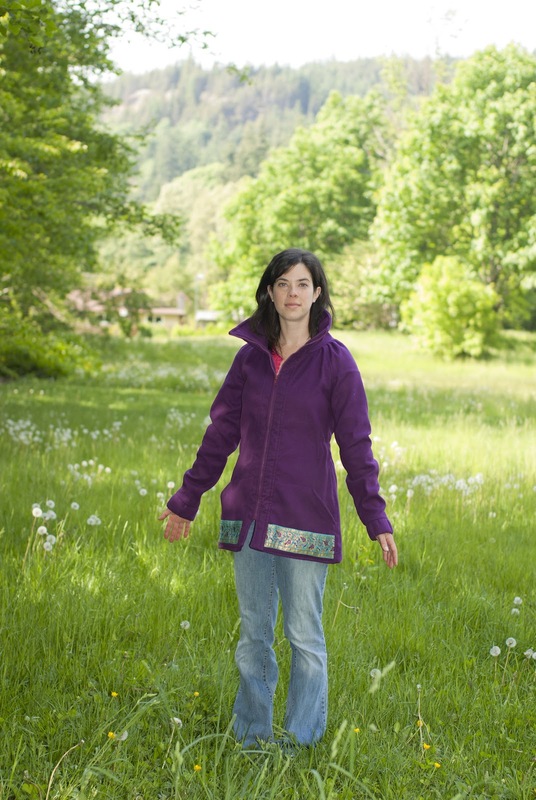 Also, I will probably be wearing the jacket zipped up mostly, so it's not like the lining will be visible. 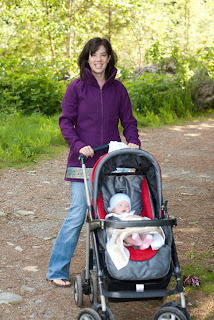 Here's a snapshot of the Sari Minoru in action - pushing the Little Miss' stroller during a walk in the Squamish sunshine! I just discovered Sewaholic and I saw all of the Minoru's. I want to make one, but I am still kinda new to sewing. Was it difficult? Hi, I didn't find it too bad but I'm more of an advanced beginner, maybe intermediate. I think it's definitely worth trying out, maybe just buy some inexpensive fabric to test it out? 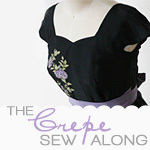 Also, DEFINITELY follow the Sew-Along posts (http://sewaholic.net/sew-alongs/) for reference.